Back and forth questions SSI funding - KUAM.com-KUAM News: On Air. Online. On Demand. Supplemental Security Income for Guam residents and a legislative resolution supporting it was the subject of a hearing today. It was the first bill Guam Del. Michael San Nicolas introduced in Congress and he was back at the Guam Congress Hall to testify in favor of a resolution supporting his SSI bill. The resolution introduced by Sen. Mary Torres - who said the bill's $42 million a year price tag is chump change to the Uncle Sam. "While that is substantial in our eyes I suppose in the federal government's eyes that really could be deemed a drop in the bucket," she said. The SSI bill was referred to the Social Security subcommittee at the end of January. The bill would ask the feds to foot the bill to the tune of $42 million a year for the 6,300 Guam residents eligible for SSI - a welfare program for those who are blind, disabled or aged 65 or older. Discussion at the hearing also centered on a funding source for the bill - with Sen. Regine Biscoe Lee asking several pointed questions. "Is the proposal budget neutral," she questioned San Nicolas. "I think you know the answer to that - of course it's not," he responded. "The federal government would need to increase the cost allocated for supplemental security income program, and that's the whole reason why I think over these past decades the attempts to move this issue forward have failed because it was combined with all the other territories." San Nicolas pointed out that HR 208 isa stand-alone measure seeking SSI benefits just for Guam. Lee pressing the funding issue since the congressional "PayGo" rule which calls for an offset for bills that increase spending. "To help us allay the concern that this measure may face some serious hurdles could you identify a funding offset," she asked. "PayGo is intended to make sure we're offsetting costs for programs that we're going to be incurring new expenses to the federal government," San Nicolas said. "But the argument needs to be made that the lack of supplemental security income to the territories is not a pay go budget item it's a mistake that the federal government has not been including territories to begin with." Sen. Lee then asked San Nicolas if he planned to ask for a PayGo waiver - which requires a majority vote of the House. "The way the Congress works is we definitely go about doing that, but I want to do that when we have the momentum," San Nicolas said. He could not provide a timeline for his SSI measure, only saying that a hearing would be scheduled when the committee deems the bill ready to move ahead. At the close of the hearing, San Nicolas invited two of the three senators present - Sen. Lee noticeably not invited to the nation's capital to get facetime with Nancy Pelosi. "Thank you so very much Sen. Torres and Sen. Shelton for supporting the work that we're doing," San Nicolas said. "And I just want to officially on the record extend an invitation to both of your offices I would like to coordinate a presentation of your resolution with the Speaker." 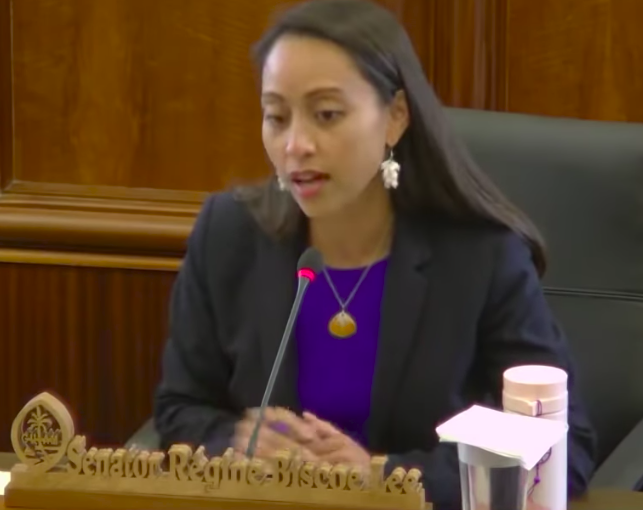 SSI benefits would provide assistance of $771 for individuals and $1157 for couples - according to data provided by Sen. Torres at the hearing.